We were wine tasting our way across France, staying in some lovely AirBnBs. We have spent time in the Champagne and Burgundy regions so far, and things were going very well. 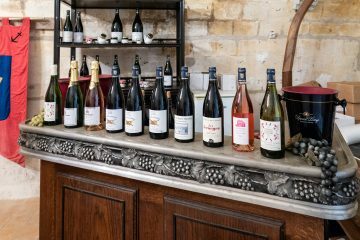 We were excited to experience the wines of the Loire region. To add to our excitement, we were booked into an AirBnB that was an actual vineyard farm house. A true winery life experience, including a personal tour and tasting from the owners, the Count and Countess of the Chateau! We were welcomed to the property by D’Arcy du Petit Thouars, who showed us around the farm house (built in 1928) and gave us some local information. There was absolutely no language barrier, and it was not because of any mastery of French on our part. We discovered that D’Arcy was born and raised in Canada, speaking English. Quite a nice coincidence for us. We settled in, shopped for some food, and gathered around the kitchen table for dinner. When in a farm house in Loire, what should you eat? Why, local cheese and meat, a baguette, and some wine from the Chateau, of course. Yes, D’Arcy left us a bottle of their wine to welcome us to their property. What a gracious way to start our stay! 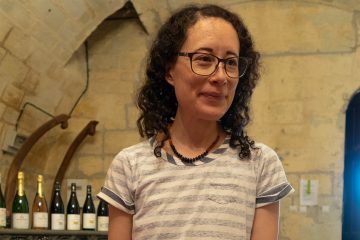 Over several days, we visited most of the tourist spots within two hours’ drive in every direction, but we could not wait for our tour and tasting with D’Arcy and her husband Sébastien. At our appointed time, we met D’Arcy and walked to their cave. This cave was carved into the side of a hill, eliminating the need to a steep staircase. 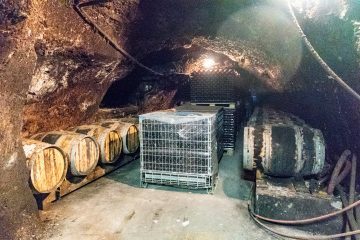 Just inside the cave door we found all of the equipment needed to crush, ferment, age, and bottle wine. It was quite an impressive display. We learned that the cave was created by quarrying rock for the construction of the chateau. 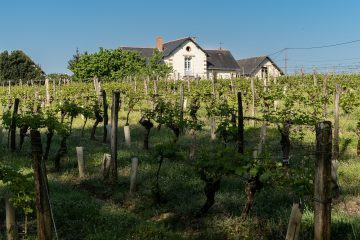 The property was deeded to the family by Cardinal Richelieu in 1636, and the 16-hectare vineyard that surrounded our farm house was planted in 1975 when the family returned to making wine. Today the winery is considered mid-sized for the region, producing about 70,000 bottles of wine a year. The chateau was originally considered to be in the Touraine AVA, but in 2016 was remapped into the Chinon AVA. 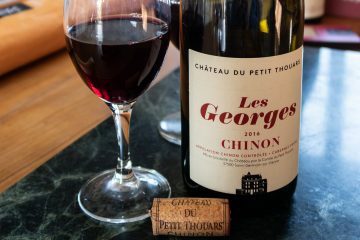 Chinon is a much better appreciated AVA, so this was a very positive change for them. After touring through the tunnels, admiring the barrels, tanks, and bottles, we retired the the tasting room on the other side of the property. It was time for our tasting! 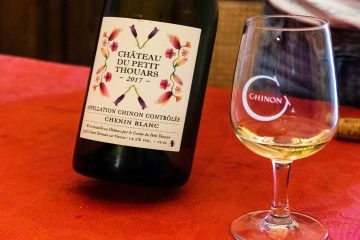 Although only about 2% of the grapes planted in the Chinon AVA are Chenin Blanc, the Chateau produces a 2017 Dry White, based on that varietal. Picked in October and bottled in February, we loved the bright citrus notes, layered over hints of zinc, with a crisp, acidic finish. We next tasted their 2017 Cabernet Franc Rosé. We appreciated the aromas of roses and chalk, and the strawberry, floral, and lychee notes on the palate. About then, Sébastien (yes, the Count) and their two adorable children came into the tasting room. The family interactions were fantastic, with the children pestering Dad in French, Mom in English, all at rapid fire. Watch a movie, go out to dinner, ride a bike — these were all matters of the highest import. We had been away from our families long enough that we loved every interaction. Once their issues were sorted, Sébastien spent some time talking about his family’s lineage and their journey making wine. We next tasted their 2017 Cabernet Franc. This wine showed a very faint nose and fun layers of elderberry and blackberry flavors and a white pepper finish. This wine can pair with anything! Their 2014 Reserve Cabernet Franc spent two years aging in oak barrels, lending a nice richness to the fruit. 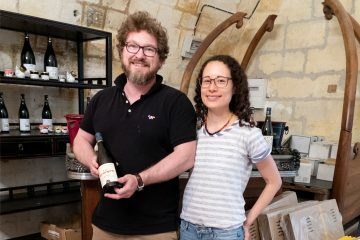 Sébastien then poured their 2015 Amiral, made from “pressed” juice, the pressing that follows the collection of the free run juice that is the source of most of their wines. This was a favorite of all of us, with smoke and pitted fruit notes and enough tannins on the finish to pair well with food. We compared this 2015 vintage with their 2010 Amiral. The ’10 showed softer tannins but retained the appealing dryness to the fruit. We then tasted their NV Sparkling, made from grapes just behind our farm house. 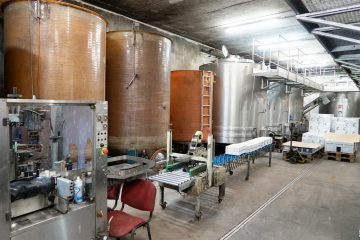 Sébastien said that they sent the juice to a cremant maker so that they would not need to invest in all of the necessary specialized equipment. We liked the off-dry flavors and soft mouth feel from the tiny bubbles. We completed our tasting with their 2015 Demi-Sec Chenin Blanc. A lovely dessert wine, we enjoyed the apricot notes, almost reminiscent of sorbet! Our tasting complete, we gratefully accepted a recommendation for dinner reservations and made our way back to our farm house. We gazed appreciatively at the back yard vines that a few years earlier had produced the grapes we had just enjoyed! 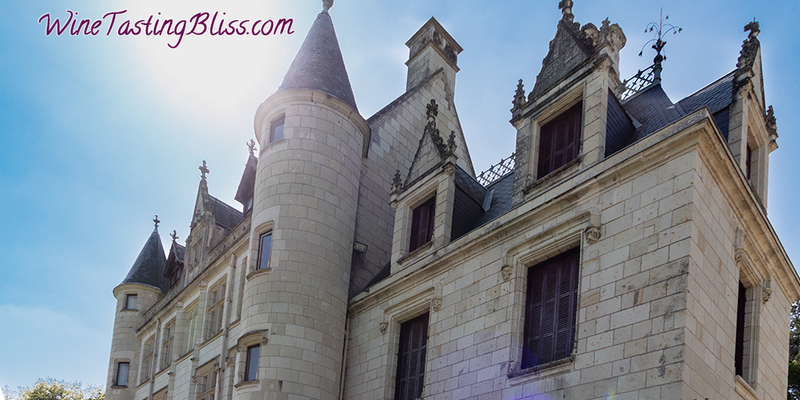 Have you visited Chateau du Petit Thouars? Click to give'em a tweet of support!